OK, I'm dating myself with that title - 1972 for those of you that are too young to remember the Woody Allen flick - but it brings to mind that there is a lot to know about these little radios and very little information to be found. Hopefully we can change that. 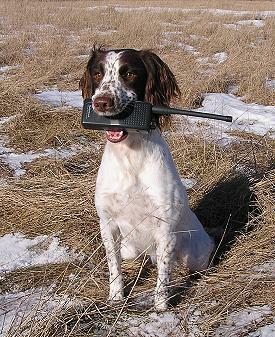 In spaniel games, especially in field trials, you may notice that many people communicate via walkie-talkies. It is believed that the practice of using "blue dot" walkie-talkies originated with David Bailey, the co-owner of NFC FC AFC KB's Sir Coach, sometime around 1990. David provided pro-handler Dan Langhans with a set of VHF business-band radios on the frequency of 154.57 mHz (dubbed by the trade as "blue dot"). Dan would use these radios to ask his assistant to bring up the next dog. As people and clubs noticed how well this system worked, they inquired about getting the same radios. David helped facilitate these acquisitions - and they were all "Motorola blue dots". At that time, the FCC had set apart several VHF business-band frequencies for itinerant use (no fixed location), and these were ideal for field trial usage. To simplify identification (to make sure that you grabbed a pair of radios that would communicate on the same frequency - most were single channel), the radios would often be identified with a colored adhesive dot. Blue was the color used for the itinerant channel 154.57 mHz, hence the term "blue dot". It made sense for all communications to be on a common channel, and because of the initial selection of David Bailey, blue dot was the channel selected. Beyond the initial use, bringing the dogs to the line at the proper time, the use of blue dot radios has expanded to general coordination of the field trial by the committee, the announcements of call backs and the announcements of the current activities. Generally, the field marshall announces the dogs on the line, dogs on the ready (next up) and will give a "play-by-play" without commentary; "Dog number 17 on his second contact." Because of this, the smooth functioning of a field trial has come to rely on the use of blue dot radios. It's hard to imagine how a 40 dog+ field could be run in a day without the use of radios. But they do have their downside. "Its hard to imagine how a 40 dog+ field could be run in a day without the use of radios." Radios, of course, add a certain amount of artificiality to an already artificial sport. That is, of course, assuming that you don't conduct pheasant drives with radios in the field. One glance at the latest Cabela's catalog will convince you that there are people who sit around dreaming of the next gadget that you absolutely need in order to hunt. On a more practical level, the improper use of radios at field trials can impede the trial. A review of "radio decorum" is in order. 1. You may not run a dog with the radio visible on your body. Because it might be easy for a dog to mistake the radio for a similar looking training collar transmitter, having a radio clipped to your belt or vest might give the handler an unfair advantage. Therefore, they are prohibited. I know at least one pro-handler who hands his radio to someone in the gallery in order to avoid any controversy. I simply dump mine into my game pouch in the back of the vest- AFTER turning it off. 2. Radios should be muted in the gallery. Some would say "turned off" altogether. The purpose here is to avoid any distraction to the dogs currently under judgement. 3. Because the blue dot channel is used for official announcements as well as bringing dogs to the line, casual conversation should be limited. If extended conversations are needed, they should be taken to another channel - green dot is often used for this purpose. Some committees use a secondary channel for event coordination such as having another crate of birds brought to the mid-way point. 4. AKC prohibitions against abusive language and saying unseemly things about the judges apply to radio conversations. In fact, you generally will have a larger audience on blue dot than you will with the radio turned off. Be careful. 5. When transmissions are not making it from the field back to the parking area, and you are between the two, you might assist by relaying important messages. Ask the marshall if that would be appropriate. What about the GMRS or FRS radios (talk-abouts) commonly found at shopping clubs or Radio Shacks? They cannot communicate with blue dot radios, so they might not serve the same purpose in the same manner. They could be used for handler/go-fer communication, but the information, such as the current "play-by-play" and call backs, would not be available. The embedded user-base of blue dot radios makes a transition to these other services impractical. Given the terrain and distances encountered, the blue dots likely provide better service that these "talk-abouts" anyhow. The big attraction to the GMRS/FRS radios is that they are marketed to a larger population, and that scale of production makes these radios more cost-effective than professional business band radios. GMRS (General Mobile Radio Service) radios require a license, and operate on UHF frequencies, which are higher frequencies than those used by the VHF blue dots. These higher frequencies may not work as well in hilly terrain, but do seem to work better in urban areas. These radios are often used as a low-cost alternative to business band radios by contractors on job sites. GMRS handheld radios typically operate with powers between two and five watts - but the trade off with higher power levels is less battery operational time (or more weight). 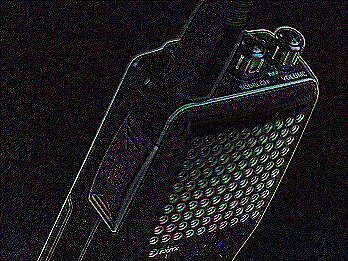 In 2004, some clubs in the Mid-East experimented with GMRS radios. If field trial clubs switch to these radios, it will be necessary for handlers to have both types of radios available for trials unless a global change is mandated. I have not heard any feedback regarding these experiments, however my professional opinion is that the GMRS UHF radios will not work as well as the traditional blue dot radios. The most common problem with blue dot radios is battery failure. When the batteries get weak, the transmissions become fuzzy and range is reduced. Many of the blue dot radios were purchased years ago, and common ni-cad batteries have a finite life. Simply replacing the batteries would revive a lot of ailing radios. FRS (Family Radio Service) radios do not require a license, operate at low power, and are generally suitable for things like keeping the family together at a theme park or for motor caravans. I have used FRS radios while deer hunting and the practical range seems to be limited to a quarter-mile. The blue dot radios were originally part of the FCC's BRS (Business Radio Service a.k.a. "business band") and a license was required. Certain BRS frequencies were deregulated in November 2002 with the creation of the MURS (Multiple Use Radio Service). The frequencies that were involved were "itinerant" (dot) frequencies including the two 154 mHz frequencies blue dot (154.57) and green dot (154.60). Under the new rules, a license is not required, however, the power limit has been reduced to two watts from the previous five watts. There were few five watts units in service as these had reduced battery life with the higher power although the range somewhat better. If you hold a BRS license that specifies operation on 154.57 mHz, you may continue using the five watt units as long as the FCC continues to renew your license. The transition to the MURS service has not been well publicized and some radio dealers may insist that you have a license in order to sell you - or reprogram - a radio. The reference in the Federal Regulatory Code which authorizes the unlicensed MURS is 47 CFR 95.1301. It seems like the MURS service, featuring radios with good range while requiring no license, would be a popular service. Currently, we seem to be stuck at the transition between licensed (BRS) service and the new MURS service. As a result, radios may seem somewhat more expensive than before and harder to locate. The marketplace seems to be responding to the new service and at least three credible models are now available. "For the radio neophyte, I would suggest that you not purchase a radio unless the seller is willing to set it up on blue dot or blue dot/green dot with no privacy codes." Because the radios commonly used for this service are normally associated with business band use, they are built to a higher level of quality than many other services. Consequently, they cost more. However, the return in durability is advantageous. Motorola, a high-grade manufacturer of professional radios, has historically been one of the most popular brands in field trial usage. Perhaps this dates back to David Bailey's original selection. Motorola radios are also fairly easy to locate. The family of Motorola radios that is most often seen at trials is the discontinued Motorola Spirit. The radio was even available in blaze orange! The Motorola Spirit series has been discontinued. Perhaps the best choice among current Motorola units is the Radius CP-150-V04 four channel unit, which can be obtained on blue dot - plus green dot and two others - for about $280 from your Motorola dealer. This is a high-quality unit and should give years of trouble free service. The accessories are pricey. The less expensive XTN series XV2100 is a single channel two watt unit (the XV1100 is a one-watt unit) with a different marketing scheme. Used Motorola Radius CT-100's may also be a good option. Bringing up a close second in usage are the now discontinued Radio Shack radios. At one time, Radio Shack even marketed and co-branded the one watt Motorola Spirit unit. I might mention that while one watt units generally have better battery life, the trade off is reduced range. One watt units are not recommended for marshalling use. Handlers who seldom transmit may find the one watt unit acceptable... that is, unless thay are late to the line and need to alert the marshall. There are many other manufacturers - mostly Japanese - including Legacy (Maxon), Icom and Kenwood. Most of these are offered as lower cost alternatives to pro-grade units such as the Motorola. You can find these radios at your local business two way radio shop; there is one in most communities of significant size as these are the same shops that service police and fire departments. In fact, you might ask a volunteer fireman where he obtained his personal walkie-talkie, if he has one. Legacy (Maxon) also makes a one watt model, the PL1145, for $100 - which might be an inexpensive alternative for those not needing to transmit. With the two watt Legacy unit, be very careful comparing prices as some dealers do not include the charger and there are two battery and charger options. One significant dealer of Legacy is phasing out the product line because of reliability problems. The Kenwood unit appears to be the best value on the market today. Kenwood has a good name among radio amateurs (hams) and has been on the US market for at least 30 years. A FroogleTM search reveals that the Kenwood radio can be bought for little more than the Legacy PL2215P. However, it comes standard with a high capacity 1500mAh Ni-Mh battery and a rapid three hour charger. The Legacy typically is supplied with a 750mAh Ni-Cad battery and an overnight charger and it would actually be more expensive if configured as the Kenwood. Battery type, size and replacement price are important considerations. Ni-MH batteries do not have a "memory" like Ni-Cads, so they do not need to be fully discharged to obtain best performance. Ni-Cads rapidly loose capacity if re-charged before they are fully dis-charged. The Ni-MH batteries are a significant improvement in battery technology and I predict that Ni-Cads will be hard to find in just a few years. You also should look at the prices for accessories such as chargers - even six slot chargers for your club. Some inexpensive models may have accessories price higher than an upscale model. Obviously there are internet dealers that might offer some good bargains. You can Google (or Froogle) the manufacturer and model number and get some good leads as shown above. E-bay is an excellent place to buy used radios, IF you have the knowledge to determine whether the radio will actually work on blue dot and if you are willing to tackle reprogramming the unit if it is not set up for blue dot. Being as I have such qualifications, I was able to buy a Spirit and a Radio Shack unit for about $30 each. Caution: The Spirit radio is also available in a UHF version; it will not work on blue dot. Used Radio Shack BTX-127 (two watt) and BTX-128 (one watt) units are also popular on E-bay. Let me emphasize again that the Radio Shack/Motorola Spirit BTX-128 unit, #19-1217, has a transmit power of only one watt. The BTX-127, with twice the power, also has a better reciever than the BTX-128. The usual pitfalls of buying on E-bay apply here too. One of the units that I purchased was new, less charger, box and manual... and had the serial number plate removed. When I contacted the only dealer within 50 miles of the seller, it was discovered that the seller also worked for the dealer. Fortunately for me, the dealer did not press charges (family member?) and therefore I did not have to return the radio at my loss. When buying used, you may have to deal with missing accessories (i.e. charger) and/or worn out rechargeable batteries. Most used units will feature Ni-Cad batteries near the end of their life cycle. Replacement of these items may bring the cost up to a new unit. For the radio neophyte, I would suggest that you not purchase a radio unless the seller is willing to set it up on blue dot, or blue dot/green dot with no privacy codes. I have programmed several units and each is different. Units must be programmed to specific frequencies and privacy codes. A privacy code - also know as "tone squelch" or "CTCSS" - allows the receiver to remain quiet unless the transmission has that code (sub-audible tone) embedded within. Since the standard for spaniel games appears to be "no code", you must have your unit set up to receive all transmissions. Not all units even offer this option. The simplest units, such as the Radio Shack BTX-127, use "dip switches" - dip meaning "dual inline pins" which refers to how it is soldered on the circuit board. With the 127 you simply open the battery cover and set the switches (there are six) to "off-off-off-off-on-off" from left to right for blue dot operation. Simple. "Off" is the down position. Radio Shack, by the way, will not supply this information to you but will insist the unit take a trip to the regional repair center. Most of their clerks do not have access to these codes. "Speak at a normal volume - speaking louder does not make your signal stronger and will, in fact, cause the signal to become distorted." To set the CTCSS code on the BTX-127, set all switches to OFF (down) then turn the unit on while holding the PTT button in. The radio will beep when you turn it on - then release the button and you will hear a longer beep. Finally, turn the unit off and return the switches to "off-off-off-off-on-off". These instuctions may work on the 128 as well. The Motorola Spirit, Kenwood and many other units, use a complicated procedure whereby you turn the unit on while holding several buttons down at the same time. You blindly scroll down the programming procedure by pushing certain buttons and listening to a synthesized voice or, in some cases, a series of beeps. This is not for the faint of heart although I was able to successfully program a Midland unit between series at a trial. The TK-2200 is programmed by default to BLUE DOT, however it has a privacy code set so that you will not be able to receive other not-like programmed units. The green light on your unit will light up, but you will hear nothing. The first step is to UNLOCK your unit. Page 13 of the current manual: "To deactivate Super Lock, with the transceiver power OFF, press and hold the Scan key (lower button) for two seconds while turning the transceiver power on. When the LED lights orange, release the Scan key. A confirmation tone will sound." If the unit is already unlocked, it will simply beep. Page 17 references the Quiet Talk settings. Page 18 tells how to set them. Follow the instructions carefully. You may also wish to program the SCAN button to momentary squelch open - see page 25. Lastly, with the unit on, hold down the middle button for four seconds until you hear the beep - this will lock the settings. If you buy your radio from 2wayradioplus.com, Chet has agreed to program them according to these instructions at no extra charge. Tell him you want it programmed for "Spaniel Field Trials". Turn on the radio while holding the PUSH TO TALK (PTT) button. You will hear "frequency" and the current setting ("frequency nine", for example). Scroll through the selections by repeatedly pushing the PTT button. Release the button when you hear "frequency three" (blue dot). Press the "monitor" button twice to store the frequency. Turn on the radio while holding the PUSH TO TALK (PTT) button. You will hear "frequency" and the current setting ("frequency three", for example). Press the "monitor" button once. You will hear "code off" or "code current setting". If "code off", you are set; push the monitor button again. Otherwise, scroll through the 38 choices back to "code off" with the PTT button, as before. Then push the monitor button once again to store. The most common problem with blue dot radios is that privacy (tone squelch) is enabled when it should not be. A Google-search for the specific model number and the word "programming" may enable you to gain information on your specific unit. There are a lot of hobbyists that enjoy "hacking" their way in to proprietary programming information and posting it on the web. The Legacy units require a computer software program ($35) and a cable to program the units. I would advise not buying these units unless the dealer will program it to blue and green dot for you. Likewise, for the Icom unit. The Kenwood unit uses a procedure similar to the Motorola procedure above... but again, it is best to ask the dealer to program the unit. Like so many other gadgets, these walkie-talkies typically use Ni-Cad rechargeable batteries. Ni-Cads work best and last longest when you discharge them fully between charges. After a field trial weekend, I turn my units on and leave them on for a day or so before re-charging. Ni-Cad performance suffers in the cold so keep the unit inside your coat on arctic days, if possible. Those who might be concerned about the health effects of a walkie-talkie (radio frequency radiation) would do well to read the FCC publication OET56. According to this publication, "Because of the relatively low power levels used (usually no more than a few watts) and, especially, because of the intermittancy of transmissions (low duty factor) the (VHF 2-WAY HANDHELD) radios would normally not be considered to cause hazardous exposure to users." Some have suggested that you angle the antenna away from your face. This will actually improve your range, so its a good idea, anyway. Discover where the microphone on your unit is located and speak into it. On the BTX-127, it is a single hole in the lower right-hand corner of the "speaker grille". On the Spirit, it is a series of holes on the lower left-hand side of the grille. You can check this out using a second radio to monitor; it makes a huge difference. Speak at a normal volume - speaking louder does not make your signal stronger and will, in fact, cause the signal to become distorted. Because radios break at the most inopportune times, a back-up radio might be appropriate for those with multiple dogs. On the other hand, you may find that doing it with no radio at all is a delightful experience. It's amazing how things that once were luxuries have become essential, but such is life in these modern days. 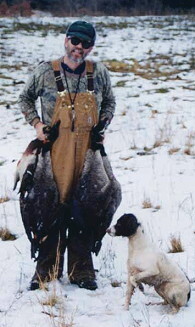 Bill Fawcett resides in the Shenandoah Valley of Virginia with his wife, Cindy, and his springer, Jenna. He is a hunter, field trialer and member of the M-AHSC. He also maintains a public FB ESS pedigree database at smythwicks.org. In his other life, he is an electronics manager for the Commonwealth of Virginia and has been active in the field of radio communications for over thirty years. He is anxiously awaiting retirement so that he can play with dogs full time and leave those stupid radios behind.